Ouija boards are without doubt the most notorious of all games, infamous for their abilities through which users are able to make contact with ‘the other side’ or the spirit realms. Ouija boards have been linked with all manner of negative entities, and few that have played with them come forth to report their experiences as being of a positive nature. The internet is saturated with the woeful tales of those who dared to dabble with the so called ‘Devils oracle’, from strange noises and occurrences following Ouija board sessions all the way up to murders and suicides, making the Ouija board a game not for the faint of heart. But what of Angel boards? Angel boards are a relatively new phenomenon that are marketed as allowing users to communicate directly with heavenly Angels only, removing the risk associated with standard Ouija boards of coming into contact with evil spirits or Demons. 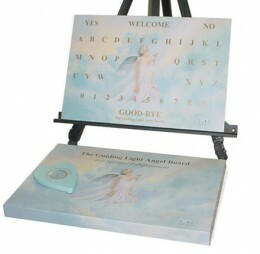 How do Angel boards differ from Ouija boards? In truth they don’t. At least not in any real sense, the box in which it arrives and the board itself may look less sinister on the surface than the ominous looking Ouija board, and it may well be illustrated with religious or fantasy style images of Angels, but for all intents and purposes, Angel boards are Ouija boards. Assuming that you believe in Angels, Demons, and the power of the Ouija board, and you were thinking of investing in an Angel board as a means of reducing your chances of becoming involved with Demonic entities then you would have to ask yourself one question – what are Demons? Because it is generally believed that Demons are in fact Angels themselves, but fallen ones, disgraced in the eyes of God for abandoning their posts to fornicate with and torment us humans. Whilst there are those who claim to have had positive experiences via the Ouija board, they are certainly few and far between. Of course the Ouija boards themselves are not evil; they are little more than a focusing tool, no more than a card, wooden or graphite board, but the entities contacted via the Ouija board are usually liars or pranksters at best, and potentially much more dangerous in nature. If you were thinking of purchasing an Angel board as an alternative to the Ouija board for religious reasons, perhaps thinking that Angel boards were more acceptable, and didn’t carry the same stigma associated with Ouija boards, think again. Angel boards, Ouija boards, and any and all similar devices are used as tools for divination. Divination is the attempt to gain insight into a question or situation by way of a standardized process or ritual, i.e. through the use of an Angel board, and ‘divination’ at least according to the scriptures, is a very bad thing indeed. And these are but a few of the religious condemnations for the practise of divination, meaning one can only assume that these condemned practises stretch to include the use of Angel guidance boards. So, are Angel Boards Evil? The answer to that question is going to depend very much upon your own personal religious beliefs, and your beliefs with regards to the standard Ouija board, because there is little doubt that despite the pastel shades and Angel graphics which adorn Angel boards, the two items are one and the same. So perhaps if you believe in such things, Angel boards are one of the cleverest tricks in recent times performed by the Demons of old, in order to tempt and possess the souls of those who might otherwise be their strongest opponents. But such matters are pure speculation, and as always the decision to play or not, can only ever be yours. Good points on both sides, I do have a commercial interest. Angel boards usually attracts people with a positive attitude and positive questions. People whom use Angel boards are usually well versed in the dangers that can be created from other talking boards.I must add most Angel board purchases are not kids just wanting to fool around. So using the buyers of this board I would have to say that Angel boards are less likely to create a bad environment.. Remember positive thinking. I am a firm believer in the part the operator plays with talking boards. Think of it as a telephone..with nice people on the other end. Promised my self I'd never use a talking board..my friend talked me into it.. we used the angel board with an opening and closing cleansing prayer..it said it was my angel and kept spelling my name over and over...and mind you my friend to this day doesn't even know how to spell my name right. I asked it some questions about my granfather that had passed long ago..when I got home that night I told my grandmother asked me how I knew those things. And then in the middle of the night I was attacked by an unseen force that pinned me to my bed for a few moments. Needles to say I will never touch a board again!